Unlike Symbolism Kiss by Gustav Klimt. 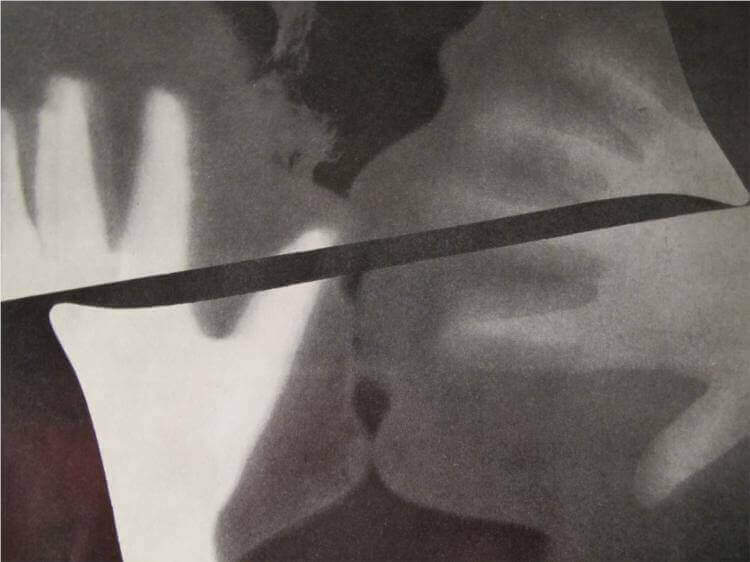 Man Ray's Kiss is made by photogram. A photogram is a picture made on photographic paper without the aid of a camera. To make this one, Man Ray exposed the paper to light at least three times. Each time a different set of objects acted as a stencil: a pair of hands, a pair of heads kissing, and two darkroom trays, which seem almost to kiss each other with their corner spouts. With each exposure, the paper darkened where it was not masked. "It is impossible to say which planes of the picture are to be interpreted as existing closer or deeper in space. The picture is a visual invention: an image without a real-life model to which we can compare it," notes curator John Szarkowski. A Surrealist might have said, instead, that it discloses a reality all the more precious because it is otherwise invisible. Man Ray claimed to have invented the photogram not long after he emigrated from New York to Paris in 1921. Although, in fact, the practice had existed since the earliest days of photography, he was justified in the artistic sense, for in his hands the photogram was not a mechanical copy but an unpredictable pictorial adventure. He called his photograms "rayographs."